Belinda Reynolds: Cover. Recording provided by the composer. Kui Dong, Larry Polansky, Christian Wolff: Track No. 1. From "Trio". Recording provided by the composers. Howard Jonathan Fredrics: Prologue From "Music for Wedekind's Lulu". Recording provided by the composer. Howard Jonathan Fredrics: Dr. Goll's March From "Music for Wedekind's Lulu". Recording provided by the composer. Howard Jonathan Fredrics: Schwartz's Death Chord From "Music for Wedekind's Lulu". Recording provided by the composer. Howard Jonathan Fredrics: Suicide From "Music for Wedekind's Lulu". Recording provided by the composer. Howard Jonathan Fredrics: Murder From "Music for Wedekind's Lulu". Recording provided by the composer. Howard Jonathan Fredrics: Prologue, Extended Version From "Music for Wedekind's Lulu". Recording provided by the composer. Erika Jürgens: Harmonie. Recording provided by the composer. Dennis Murphy: Pieces for Prepared Piano. Recording provided by the composer. Remastered by Malted/Media. Elaine Tomazi Freitas: Absolutely Nothing to Look Back At. Recording provided by the composer. David Gunn: Caccia Red-Handed. Recording provided by the composer. Remastered by Malted/Media. Tim Price: Two Humps are Better than One. North Wind Ensemble. Recorded by Malted/Media. Scott L. Miller: Dies Sanctificatus. Recording provided by the composer. Erika Jürgens: Kitty. Recording provided by the composer. Pamela Zero: The Yearning. Recording provided by the composer. Water Violet (Raffaella Graziosi): Spirali. Recording provided by the composer. Paul Steenhuisen: Mycenean Wound. Recording provided by the composer. David Gunn: Best of the Bazaar, Mark XLVII. Recording provided by the composer. Daron Hagen: Sennets, Cortege, and Tuckets. Baylor University Wind Ensemble, Michael Haithcock, conductor. From "Night Again". Arsis CD 112. Dennis Báthory-Kitsz: No Money (Lullaby for Bill). Recording provided by the composer. Robert Ashley: She Was a Visitor. From "Automatic Writing". Lovely Music CD LCD 1002. Joseph Benzola: Portraits of the Dead: Edgar Varèse. Recording provided by the composer. Elodie Lauten: Quantesaurus. From "Inscapes from Exile". New Tone CD 21750 7004 2. Beth Anderson: Minnesota Swale. Slovak Radio Symphony Orchestra Bratislava, Joel Eric Suben, conductor. From 'New Music for Orchestra". Opus One CD 156. Mary Jane Leach: Windjammer. From "Ariadne's Lament". New World Records CD 80525-2. Warren Burt: La Strega Bianca Della Luna II. From "Sonic Circuits VI" Innova CD 115. Carson Kievman: Toccatada. Recording provided by the composer. Nick Didkovsky: Dead Silence. Dr. Nerve. From "Skin". Cuneiform CD RUNE 70. Eric Salzman: Queen's Collage. From "Wiretap". Finnadar LP QD 9005. Martha Mooke: Enharmonic Vision. Maximum Music Connectons CD VMP 80301. David Gillingham: Concertino for Four Percussion. North Texas Wind Symphony, Eugene Migliaro Corporon, conductor. From "Sojourns". Klavier Records International CD KCD-11099. Pauline Oliveros: Epigraphs in the Time of AIDS, No. 2. Deep Listening Band. From "Suspended Music". Periplum CD P-0010. Hildegard Westerkamp: Talking Rain, excerpt. From "harangue I". earsay CD es98001. Peggy Madden: Metal Wing, Sculpted Dream. Recording provided by the composer. John Cage: 3 Dances for 2 Prepared Pianos, #1. Patrick Moraz, sampled piano. From "A Chance Operation: The John Cage Tribute". Koch International Classics CD 3-7238-2 Y6x2. Land: Frame. From "archipelago". Periplum CD P-00040. Brian Eno: The Roil, The Choke. From "Nerve Net". Warner Brothers CD 9 45033-2. John Oliver: Copper Flying. From "Icicle Blue Avalanche". earsay CD 98004. Ellen Fullman: Texas Travel Texture, excerpt. From "Suspended Music". Periplum CD P-0010. Giorgio Magnanensi: Sere. From "harangue I". earsay CD es98001. Michael Lowenstern: Spasm. From "Spasm". New World CD 80468-2. George Gershwin: Summertime. Michael Lowenstern, bass clarinet. From "Spasm". New World CD 80468-2. Daniel Pemberton and Charles Uzzell Edwards: Telephony. From "Enhanced Environments". Subversal Records CD SBR0011. Warren Burt: Square Root of 3 - chains fo fifths - linear order / equal probability - triangle waves. From "Five for the Coming of Spring". Recording provided by the composer. Warren Burt: Square Root of 5 - chains of thirds - triangle distribution - inharmonic difference tones. From "Five for the Coming of Spring". Recording provided by the composer. Jeff Harrington: New Zion Pastorale. Recording provided by the composer. Available on MP3.com. Jeff Harrington: Spirale d'Arco. From "Anamorphosis". Available on MP3.com. Jeff Harrington: Morph-Cataclysm. From "Obliterature". Available on MP3.com. Jeff Harrington: Espace des Cloches. Recording provided by the composer. Available on MP3.com. Jeff Harrington: Piano Prelude #18. From "Piano Preludes 1991-98". Available on MP3.com. Jeff Harrington: Piano Prelude #19. From "Piano Preludes 1991-98". Available on MP3.com. Barbara Benary: Mostly Slendro Passacaglia. From "New Gamelan / New York". GSOL Records CD GSOL CD-1. Johnny Reinhard: Trio on the Cuff Number 6 From "The Raven" The Stereo Society CD SS002. Johnny Reinhard: Trio on the Cuff Number 1 From "The Raven" The Stereo Society CD SS002. Johnny Reinhard: Trio on the Cuff Number 9 From "The Raven" The Stereo Society CD SS002. Mary Lee Roberts: bird from white writing. From "Six Compositions". Open Space CD 9. Daron Hagen: Sennets from Concerto for Brass Quintet. Wisconsin Brass Quintet. From "Images". [no label] 2962-MCD. Daron Hagen: Tuckets from Concerto for Brass Quintet. Wisconsin Brass Quintet. From "Images". [no label] 2962-MCD. Jon Siddall: Sunflower. 40 Fingers Saxophone Quartet. From "Live Fingers". Artifact (Canada) CD ART-017. David Cleary: Five Character Studies. Artaria Quartet of Boston. From "Inventing Situations". Centaur CD CRC 2251. Piotr Lachert: 3o Quartetto per archi: Immer allein, I and IV. Recording provided by the composer. Jeff Harrington: Piano Prelude #22. From "Piano Preludes 1991-98". Available on MP3.com. Jeff Harrington: Anamorphosis. From "Anamorphosis". Available on MP3.com. Jeff Harrington: Tetra Mnemosyne for String Trio. From "Anamorphosis". Available on MP3.com. Jeff Harrington: Tetra Mnemosyne IV. Recording provided by the composer. Available on MP3.com. Fred Frith Guitar Quartet: Motormouth. From "Upbeat". Ambiances Magnétiques CD AM 063 CD. Fred Frith Guitar Quartet: Out to Bomb Fresh Kings. From "Upbeat". Ambiances Magnétiques CD AM 063 CD. Fred Frith Guitar Quartet: No Bones. From "Upbeat". Ambiances Magnétiques CD AM 063 CD. Matthew H. Fields: Call of the Shofar. From "Kabala". MMC CD MMC2087. Gwyneth Walker: Essay for Orchestra. Recording provided by the composer. Gwyneth Walker: Open the Door. Recording provided by the composer. David Gunn: Best of the Bazaar, Mark XLVIII. Recording provided by the composer. Gwyneth Walker: This Train. From "1998 All-OMEA Festival Concert" Century Records CD. Gwyneth Walker: I Thank You God. From "ACDA National Convention: Chicago 1999 -- National Women's Honor Choir". ViaMedia A/V CD. Gwyneth Walker: Symphony of Grace, First Movement. Women's Philharmonic, Apo Hsu, conductor. Recording provided by the composer. Gwyneth Walker: An American Concerto, First Movement. Melissa White, violin. From "Paul Freeman Introduces..." Albany CD. Gwyneth Walker: An American Concerto, Second Movement. Melissa White, violin. From "Paul Freeman Introduces..." Albany CD. Maxine Warschauer: Revelation. From "Robert Black Conducts". Slovak Radio Symphony Orchestra. MMC CD MMC2008. Lou Harrison: Ibu Trish. Evergreen Club Gamelan Ensemble. From "Palace". Artifact (Canada) CD ART-012. David Demnitz: Sixties. Gamelan Son of Lion. From "New Gamelan/New York". GSOL CD-1. Barbara Benary: Lelambutam Meow, excerpt. Gamelan Son of Lion. From "The Lion Sings". Recording provided by the composer. Barbara Benary: Hells Bells. Gamelan Son of Lion. New Wilderness Audiograpics cassette 8442A. Barbara Benary: Aural Shoehorning. Gamelan Son of Lion. Recording provided by the composer. Barbara Benary: Mostly Slendro Passacaglia. Gamelan Son of Lion. From "New Gamelan/New York". GSOL CD-1. Daniel Goode: Slendro Clarinet. Gamelan Son of Lion. From "New Gamelan/New York". GSOL CD-1. Dennis Murphy: Thumese Medley. Recorded by Malted/Media. David Demnitz: Pick Your Notes. From "Gamelan as a Second Language". Gamelan Son of Lion. GSOL CD-2. Otok Bima Sidarta: Mubeng Beteng. From "Mana689, New Music of Indonesia Vol. 2". Lyrichord CD LYRCD 7420. Barbara Benary: Sleeping Braid. Gamelan Son of Lion. New Wilderness Audiograpics cassette 8442A. Barbara Benary: Woodstock. Gamelan Son of Lion. New Wilderness Audiograpics cassette 8442A. Barbara Benary: Dragon Toes. Gamelan Son of Lion. New Wilderness Audiograpics cassette 8442A. György Ligeti: Lux Aeterna. Schola Cantorum Stuttgart, Clytus Gottwald, conductor. Wergo CD 60162-50. Elma Mayer: The Green Shade. From "Elma Mayer". Ponk Records CD P-F010. Larry Polansky: Four-Voice Canon #4. From "The Theory of Impossible Melody". Artifact (USA) CD 1004. Leo Kupper: Glissandi Vocaux from Amkea. Anna Maria Kieffer, voice. From "Ways of the Voice". Pogus CD 21018-2. Daron Hagen: Wedding Dances. North Texas Wind Symphony, Eugene Migliano Corporon, conductor. From "Sojourns". Klavier CD KCD-11099. Daron Hagen: Bandanna, opening. Recording provided by the composer. Daron Hagen: Bandanna, seduction scene. Recording provided by the composer. Daron Hagen: driving bop from Concerto for Flügelhorn and Orchestra. Baylor University Wind Ensemble, Michael Haithcock, conductor. From "Night Again". Arsis CD 112. Nick Didkovsky and Larry Polansky: ...slippers of steel. From "The Time is Now". Frog Peak Music CD FP006. Kzysztof Penderecki: Stabat Mater. Schola Cantorum Stuttgart, Clytus Gottwald, conductor. From "ionisation: music of varèse, penderecki, ligeti". Vox Box CD CDX-5142. Daron Hagen: ...Silently Dispersing from Dear Youth. Susan Crowder, soprano. From "Songs by Daron Hagen". Arsis CD 106. Jonathan and Darlene Edwards: April in Paris. Info to follow. Jonathan and Darlene Edwards: I Love Paris. Info to follow. Guy Klucevsek: Waltzing Above Ground. From "Flying Vegetables of the Apocalypse". Experimental Intermedia CD XI 104. Guy Klucevsek: Samba D Hiccup. From "Manhattan Cascade". CRI CD 626. Guy Klucevsek: Blue Window. From "Flying Vegetables of the Apocalypse". Experimental Intermedia CD XI 104. Guy Klucevsek: The Grass, It Is Blue. From "Flying Vegetables of the Apocalypse". Experimental Intermedia CD XI 104. David Gunn: Best of the Bazaar, Mark XLIX. Recording provided by the composer. Daron Hagen: Sennets, No. 1 from Concerto for Brass. Wisconsin Brass Quintet. From "Images". Mark Custom Recording 2962-MCD. Daron Hagen: Invention, No. 1 from Concerto for Brass. Wisconsin Brass Quintet. From "Images". Mark Custom Recording 2962-MCD. Daron Hagen: Tuckets, No. 1 from Concerto for Brass. Wisconsin Brass Quintet. From "Images". Mark Custom Recording 2962-MCD. Daron Hagen: Finale, Homage à James Brown. From Duo for Violin and Cello. From "Strings Attached". Arsis CD 111. Daron Hagen: Reprise. From Duo for Violin and Cello. From "Strings Attached". Arsis CD 111. Guy Klucevsek: Dining in the Rough in the Buff. From "Scenes from a Mirage". Revew Records CD rere 106cdm. Guy Klucevsek: Loosening Up the Queen. From "Flying Vegetables of the Apocalypse". Experimental Intermedia CD XI 104. Pauline Oliveros: The Well/The Gentle. From "The Well and The Gentle". hat ART LP 2020. Lois Vierk: Manhattan Cascade, beginning. Guy Klucevsek, accordion. From "Manhattan Cascade". Phil Kline: Bachman's Warbler. From "Glow in the Dark". CRI CD 801. Phill Niblock: String Quartet No. 2, from Five More String Quartets. Solider String Quartet. Experimental Intermedia CD XI 111. Ellen Fullman: Texas Traveler. From "Suspended Music". Periplum CD P0010. Dennis Báthory-Kitsz: Composition in Low Tones, 1970. From "Autonica Concretia". Malted/Media CD 9804-2. Pauline Oliveros: The Receptive. From "The Well and The Gentle". hat ART CD 2020. Dennis Báthory-Kitsz: Zonule Glaes II. Styx-Q String Quartet. Malted/Media CD 9905-2. Lois Vierk: Manhattan Cascade, beginning. Guy Klucevsek, accordion. From "Manhattan Cascade". CRI CD 626. Aaron Jay Kernis: Phantom Polka. From "Flying Vegetables of the Apocalypse". Experimental Intermedia CD XI 104. Daron Hagen: Minute Scherzo, from Duo for Violin and Cello. From "Strings Attached". Arsis CD 111. James Tenney: For Ann, Rising. From "Selected Works 1961-1969". Frog Peak Music CD FP 001. Eliane Radigue: Kyema, excerpt. Experimental Intermedia CD XI 119. James Bohn: Improvisation on toy piano. Live performance by the composer. Udo Kasemets: Quarkanon, from Chaosmosis. From "Timetrip to Big Bang and Back". Artifact (Canada) CD ART-010. Carson Kievman: Introdictus. David Arden, piano. From "The Temporary & Tentative Extended Piano". Recording provided by the composer. Dennis Darrah: Jimibali. Live performance by the composer. Laurie Spiegel: Three Sonic Spaces, II. From "Unseen Worlds". Aesthetic Engineering CD 11001-2. Christopher Koenigsberg: Artifact #2? ArtMix. From "Brains". PWOA CD PWOA 011. Martha Mooke: News. From "Enharmonic Vision". Maximum Music Connections CD VMP 80301. Anne La Berge: revamper. From "blow". Frog Peak Music CD FP 004. Elodie Lauten: Barbie's Abduction. From "Inscapes from Exile". Robi Droli CD fy7004. Elodie Lauten: Ordinary Spatial Distance. From "Inscapes from Exile". Robi Droli CD fy7004. Howard Jonathan Fredrics: Prologue. From Music for Wedekind's "Lulu". Recording provided by the composer. Howard Jonathan Fredrics: Dr. Goll's March. From Music for Wedekind's "Lulu". Recording provided by the composer. Howard Jonathan Fredrics: Schwartz's Death Chord. From Music for Wedekind's "Lulu". Recording provided by the composer. Howard Jonathan Fredrics: Suicide. From Music for Wedekind's "Lulu". Recording provided by the composer. Howard Jonathan Fredrics: Murder. From Music for Wedekind's "Lulu". Recording provided by the composer. Howard Jonathan Fredrics: Alwa's Love Theme. From Music for Wedekind's "Lulu". Recording provided by the composer. Michael Torke: Purple. Baltimore Symphony Orchestra, David Zinman, conductor. From "Color Music". Argo CD 433 071-1. James Bohn: Sonata #2 for Toy Piano. Live performance by the composer. James Bohn: Sonata #3 for Toy Piano. Live performance by the composer. Larry Polansky: Movement for Andréa Smith. From "Simple Harmonic Motion". Artifact (USA) CD ART 1011. David Gunn: Cowbellies. From "Somewhere East of Topeka". Forthcoming CD provided by the composer. Steve Gryc: ...fish in shallow water from Five Preludes for Flute Alone. From "New music for Flute & Oboe". Opus One CD 166. Steve Gryc: ...jade fountain from Five Preludes for Flute Alone. From ""New music for Flute & Oboe". Opus One CD 166. 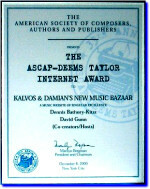 David Gunn: Best of the Bazaar, Mark XILa. Recording provided by the composer. Judy Dunaway: Fifty 210. From "New York Guitars". CRI CD 698. Nick Didkovsky: Sister Cancer Brother Dollar. Dr. Nerve. From "Every Screaming Ear". Cuneiform CD RUNE 88. Loren Mazzacane Connors: Departure. From "New York Guitars". CRI CD 698. John Oswald: Plexure, Nos. 1-3. Avant (Japan) CD AVAN 016. John Oswald: Plexure, Nos. 4-8. Avant (Japan) CD AVAN 016. The Devil's Advocates: 1 Para. Live performance in K&D Studio Z. The Devil's Advocates: Andersonstown. Live performance in K&D Studio Z. The Devil's Advocates: Moss #3. Live performance in K&D Studio Z. The Devil's Advocates: The Dunmore Lassies. Live performance in K&D Studio Z. The Devil's Advocates: Fair and Tender. Live performance in K&D Studio Z. The Devil's Advocates: So White. Live performance in K&D Studio Z. The Devil's Advocates: The Ones Behind the Wire. Live performance in K&D Studio Z. The Devil's Advocates: Slán Abhaile. Live performance in K&D Studio Z.
Johnny Cash: Folsom Prison. Live performance by The Devil's Advocates in K&D Studio Z. The Devil's Advocates: The Vermont State Song. Live performance in K&D Studio Z. The Devil's Advocates: Epicenter Our Town. Live performance in K&D Studio Z. The Devil's Advocates: Kelly the Boy from Killane. Live performance in K&D Studio Z.
Ken Valitsky: Meaning - Less. From "New York Guitars". CRI CD 698. Carson Kievman: Symphony No. 2 (42), "Passage". Polish Radio National Symphony Orchestra - Katowice, Delta David Gier, conductor. New Albion CD NA081CD. James Grant: Lament for String Orchestra. Czech Radio Symphony Orchstra, Sabrina Maria Alfonso, conductor. Private CD available from James Grant. Carson Kievman: Wake Up, It's Time to Go to Bed. Tanglewood Music Festival. Recording provided by the composer. Carson Kievman: Introdictus. From "The Temporary & Tentative Extended Piano". David Arden, piano. Recording provided by the composer. Carson Kievman: Toccatada. From "The Temporary & Tentative Extended Piano". David Arden, piano. Recording provided by the composer. Carson Kievman: Sine Nomine. The Binchois Consort, Andred Kirkman, director. Recording provided by the composer. David Cleary: Lake George Overture. Bohuslav Martinu Philharmonic, Milos Machek, conductor. Vienna Modern Masters CD VMM 3021. James Grant: Chart - Overture for Orchestra. Czech Radio Symphony Orchstra, Sabrina Maria Alfonso, conductor. Private CD available from James Grant.